The Graham Crawford Show: Graham Crawford Show - Civic Panel, Series 7 - Backward Glances. Forward Thoughts. The Graham Crawford Show was created out of a belief that we need to talk about the issues and opportunities facing Hamilton in a way that generates debate and fosters understanding. The goal of show is to provide smart, progressive talk from regular panelists, subject matter experts, and personal observations. The show is posted weekly and always focuses on issues affecting you and the City of Hamilton. All of the people involved in The Graham Crawford Show do so because they believe that dialogue creates understanding. And the more we understand our city, the better we can all help it to realize its potential. All of the shows are recorded in downtown Hamilton in the studios of QED Media. Let’s talk Hamilton. Our Civic Panelists are Peter Graefe, Maureen Wilson and Ryan McGreal, begin the year by looking back at the previous one. They share their answers to questions in 7 separate categories, all focused on the City of Hamilton in 2016, and with an eye to 2017. 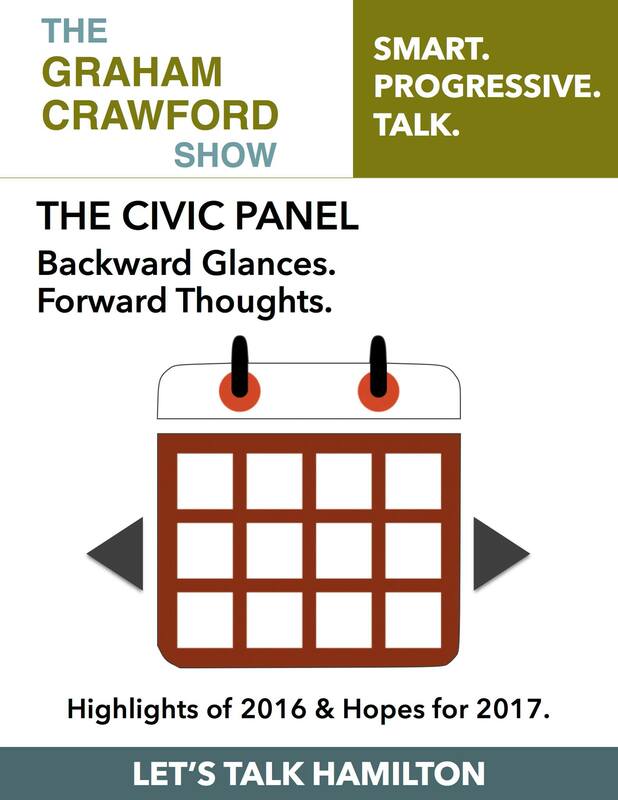 All on this Civic Panel edition of The Graham Crawford Show we’re calling: Backward Glances. Forward Thoughts. All shows are produced and recorded by Dave Beatty at Q.E.D. Media in downtown Hamilton.